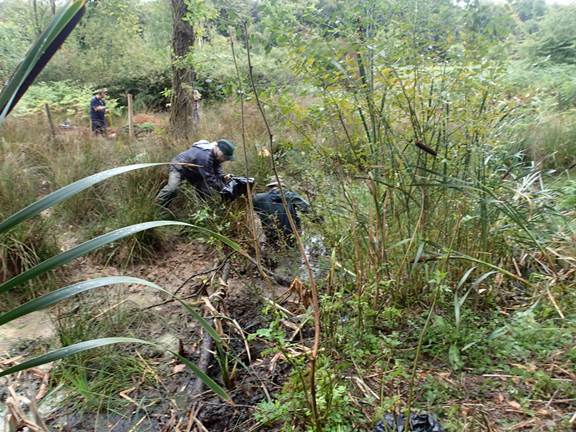 The team were split between two sites both, of which, involved pond clearance. 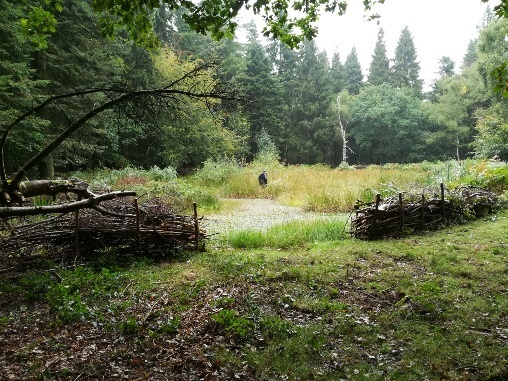 Kingspool is near Edge End and the team there built an anti boar hedge around the pond. 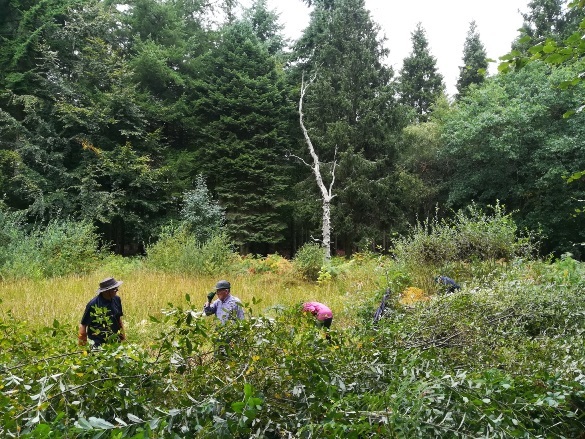 Bladderwort pond is near Staple Edge and the team were tasked with removing the invasive Parrot Feather weed and re-fencing the pond. 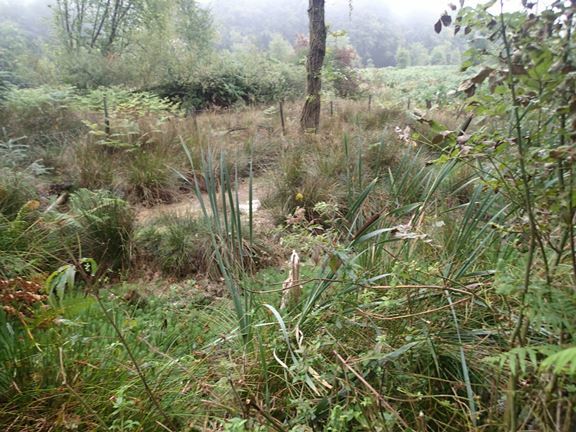 This is the first view of the pond before we started clearing it. There was some tatty, inadequate fencing around it and the wild boar had obviously been through the fencing to wallow in the pond. We pulled up all the Parrot Feather (Myriophyllum aquaticum),weed. Parrot Feather is a submerged plant that frequently trails along the ground or water surface of ponds, lakes and canals. It is native to South America and blooms from the spring to autumn. It is easy to see why this plant is called Parrot Feather: its delicate, feathery, bright green leaves grow in profusion. He spent all morning scrummaging around in the yucky pond and really enjoyed himself! We are very pleased to say that it was our FC Ranger who sank up to her hips in the pond rather than one of us! 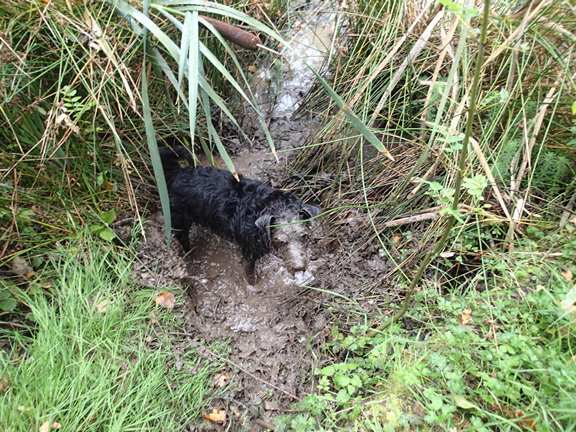 There were two bucketful's of very muddy water emptied out of her wellies after thsi! 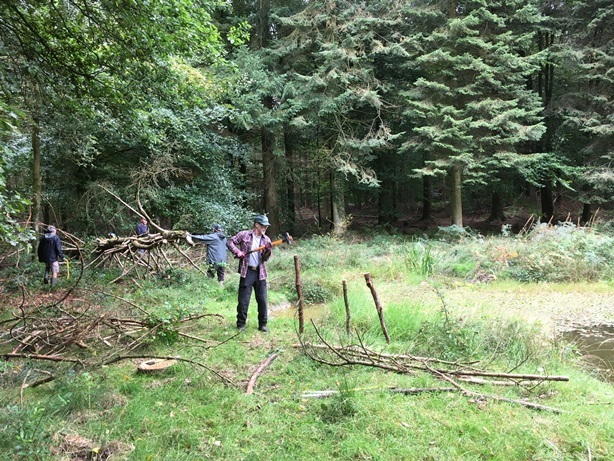 At the beginning of the day, stakes were driven in to provide a stabilising effect to support the brush which was cut in the surrounding area. The pond is quite full of various plant types and it is in a healthy state. The brush fence is looking good! Cutting round the edges to allow more light through the canopy.